The move to stop county-level hospitals from deriving their income from 15% markups on pharmaceuticals will severely dent their revenue stream and threaten services, health economists have warned. China has already trialled drug commission bans in 300 county hospitals and now plans to extend the system to 1000 hospitals nationally, Caixin reports. However, the plan could leave hospitals short of funds and thus reduce the level of services and hurt the morale of medical workers, academics and doctors say. The State Council has said local governments should help hospitals to make up for the lost income from drug sales. However,Wang Zhen, a research fellow at the Chinese Academy of Social Sciences, said local governments were already strained financially and they don't have extra money for hospitals.Wang said that without government subsidies and other measures in place, scrapping the markup practice might wind up creating other problems because hospitals will find alternative ways to make money. Children with autism in China face experience high rates of physical abuse from their parents and family members, a study from Henan shows. In a survey of 180 children with autism, Zhengzhou researchers found that 36% had recently experienced severe physical maltreatment such as slapping on the face, being beaten with objects or kicked. Less severe physical maltreatment such as being slapped, or shaken was experienced by 86% of autistic children. Tibetan monks have low rates of hypertension, according to a study carried out in Gansu. The survey of 984 monks found that 19% had hypertension, compared to 34% of the local population. However, despite having low rates of high blood pressure, there were also low rates of awareness, treatment and control of hypertension among monks, the researchers found. Encouraged by new government policy a surgical oncologist has opened Guangzhou's first major private clinic. The clinic set up by Dr Lin Feng will offer speedy diagnosis and high quality treatment by a well known surgeon previously practicing at the renowned 3rd Hospital of Guangzhou. The clinic charges about 2-3000 yuan fees, and offers high quality diagnosis and surgery without the long waits and rushed consultations of public hospitals, its operators say. Two doctors at a Fuzhou hospital were stabbed in an attack by a 66-year old male patient, local media report. One male and one female doctor were seriously injured by the man armed with a 40cm knife who had been attending the Fuzhou hospital to have his haemorrhoids treated. A hospital spokesman said the man was unhappy with the treatment he received for his haemorrhoids and stabbed a female doctor in the hip. The male doctor who tried to restrain him was also stabbed in the arm. Tax breaks are to be introduced for Chinese consumers who take out private health insurance, the government has announced. 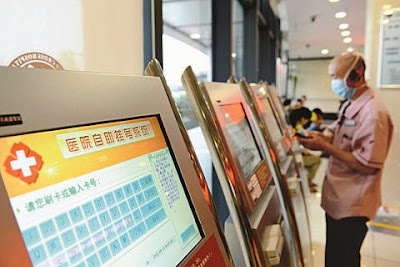 People who spend more than 2,400 yuan on commercial health insurance policies per year will now only pay individual taxes on income above 3,700 yuan per month, instead of 3,500 yuan, CCTV has reported. The move is part of a government campaign to encourage Chinese people to purchase private health policies in addition to their standard government benefits.